Some of you might have seen this post pop up on your Facebook and tried to remember when you liked this page or what it’s all about. Granted I’ve been on a little hiatus recently and although I’ve been on some really cool dates, I just haven’t put pen to paper. That means I will hopefully now be able to fire out some great dates for you in quick succession. Now then, during my hiatus I tended to stay home and cook delicious meals (and take photos #hammos15minutemeals). Last week I was able to couple all of my loves into one date and honestly it worked a treat. So what I have for you is a breakfast date, followed by a market trip and then the recipe to make when you invite your date home for dinner. First up breakfast at Code Black Coffee in North Melbourne. If you know anything about cafes in Melbourne, you’ll know how crazy we Melbournians go for the new cool one. We showed up to Code Black at the peak breakfast time of 11am on Sunday and we got a table straight away… let me say that again… we were seated straight away! Code Black have opened up shop in an old mechanics workshop on Howard Street in North Melbourne. The café itself is beautiful and bright, with plenty of space and ample seating with a mezzanine above the open kitchen. As you’d expect from the name their coffee is a stand out and their menu backs that up with plenty of interesting options like for him (smoky black beans w crispy sliced pork belly) and her (acai superfood breakfast bowl). 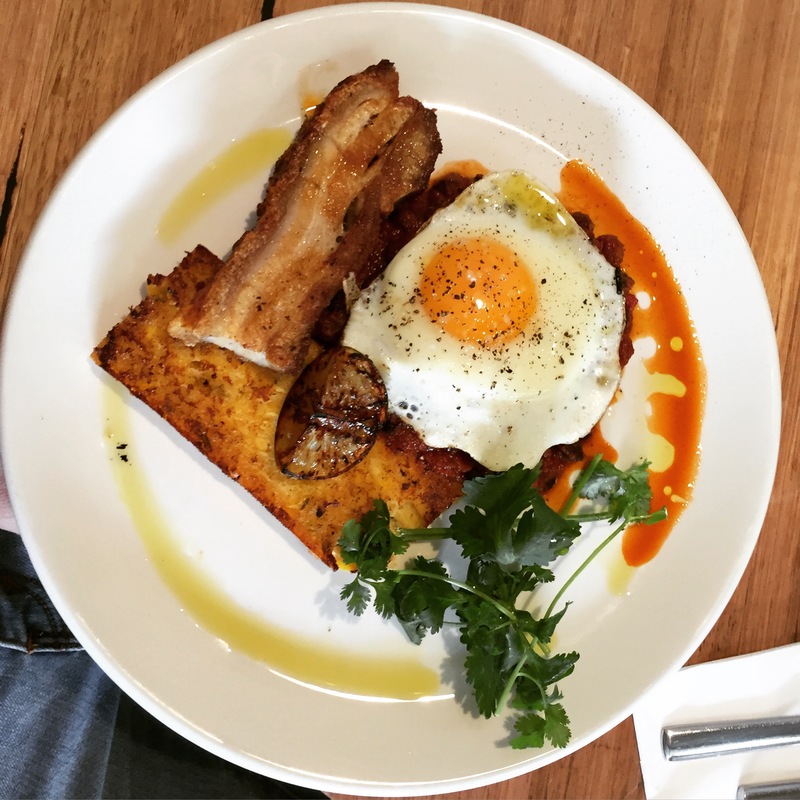 Once you have enjoyed a lovely breakfast or brunch fix up the bill and nonchalantly mention to your date that you need to pick up a few things at the Queen Vic Market and invite them to join you. I love the hustle & bustle of the Meat & Fish Hall so I’d recommend using this experience in an enticing way to get your date interested in joining you for dinner later on. A little dish I put together recently was a recipe from the Depot restaurant cookbook in Auckland (definitely a 50 First Date recommendation if you are ever there). 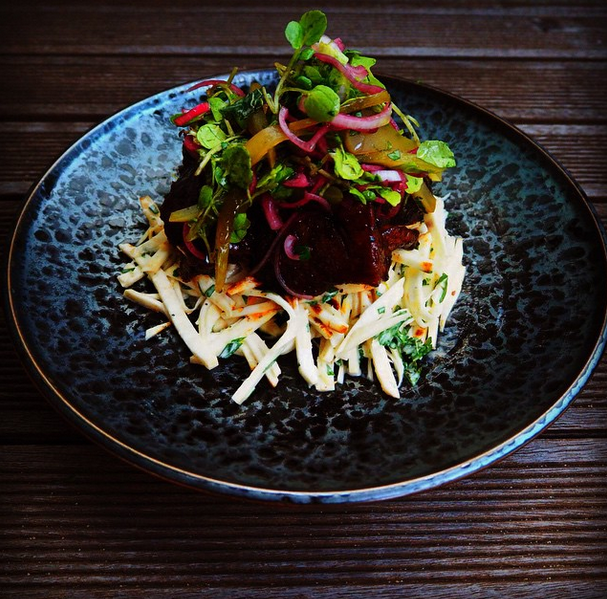 It sounds complicated but it’s dead easy to make as most of it is done ahead of time, so it’s perfect for a dinner date – Braised beef cheek with celeriac remoulade and pickled shallots. Follow that link for the recipe and make sure you’ve printed off your ingredients so you can pick them up from the Queen Vic Market. And remember, you won’t see beef cheeks in any butcher windows – you have to ask for it (all part of the date theatre). FYI this was my attempt.